be placed parallel at a turn in a multiple run, as shown in figure 5-3. If standard elbows are used, it is impossible to place them parallel at the turns. They will have an appearance similar to the one shown in figure 5-1. Except as discussed in the NEC® , metal raceways, cable armor, and other metal enclosures for conductors will be joined together into a continuous electric conductor and will be connected to all the boxes, fittings, and cabinets to provide effective electrical continuity. Raceways and cable assemblies will be mechanically secured to boxes, fittings, cabinets, and other enclosures. This action ensures electrical continuity of metal raceways and enclosures. Normally the power-distribution feeder from the power pole to a building is secured to the building with an insulator bracket. Brackets should be mounted high enough so the power feeders are never suspended lower than 18 feet over driveways and 10 feet over walkways. Figure 5-3. 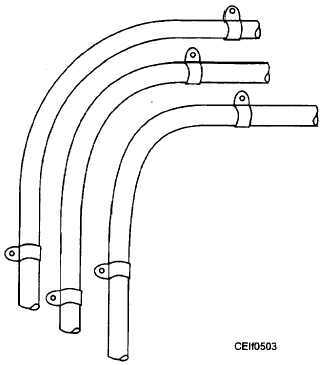 - Right-angle turns with bent conduit. conduit or a raceway. Service-entrance cable should be used for this purpose. Armored cable or nonmetallic-sheathed cable should be used for the interior wiring of the building. At each building, the wiring system must be grounded. This provision is in addition to the ground at the power pole. Grounds must be established at each point of entrance to each building; and, if possible, all these grounds should be tied together on driven grounds. Also, for added safety, the water system should be tied at each building to the driven ground for that building. A well-grounded wiring system adds to the safety of the entire installation. The following discussion applies to the types of wiring used for voltages up to 600 volts, unless otherwise indicated. Each type of insulated conductor is approved for certain uses and has a maximum operating temperature. If this temperature is exceeded, the insulation is subject to deterioration. In recent years, modified ethylene tetrafluoroethylene (2 and ZW) and perfluoroalkoxy (PFA and PFAH) cables have been allowed for high-temperature operations. Each conductor size has a maximum current-carrying capacity, depending on the type of insulation and conditions of use. Conductors of more than 600 volts should not occupy the same enclosure as conductors carrying less than 600 volts, but conductors of different light and power systems of less than 600 volts may be grouped together in one enclosure if all are insulated for the maximum voltage encountered. Communication circuits should not occupy the same enclosure with light and power wiring. Boxes or fittings must be installed at all outlets, at switch or junction points of raceway or cable systems, and at each outlet and switch point of concealed knob- and-tube work. The number of conductors, permitted in each size and type of raceway, is definitely limited to provide ready installation and withdrawal. For conduit and electrical metallic tubing, refer to the NEC® .